This part has been characterized for GFP expression in the pCDF plasmid by the 2015 LASATX iGEM team. We placed the T7 promoter in front of the sfGFP gene (BBa_K1624004). The experimental construct was placed in a pCDFDuet-1 vector and transformed into BL21(DE3) cells. We used BL21(DE3) cells without the plasmid containing T7 as our negative control. Cells were grown overnight. A 1:100 dilution was made, and cultures were grown with 20% glucose to 0.6 OD. At 0.6 OD, cells were resuspended in IPTG and induced for 2 hours. After induction, cells were washed and resuspended in PBS buffer. Fluorescence was then measured at 600 nm for 25 flashes. Bars show average of triplicates. Error bars show standard deviation. 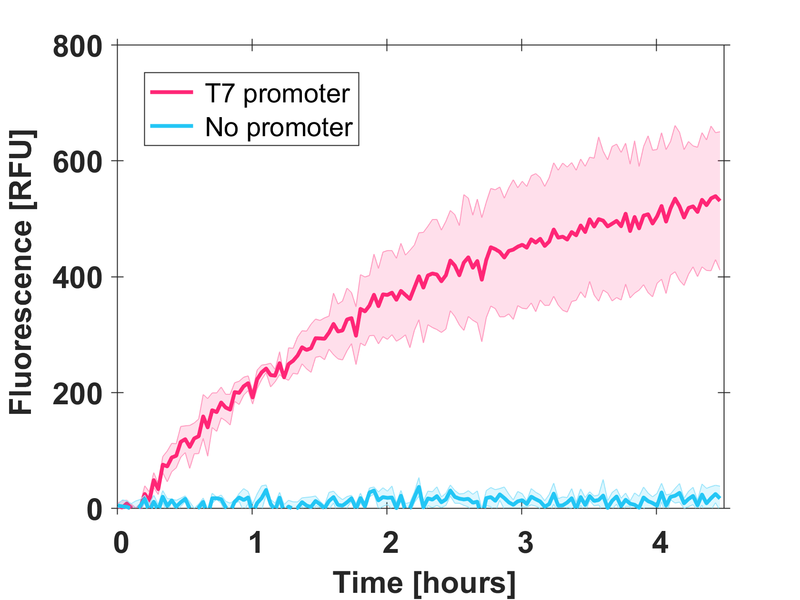 The sfGFP gene placed downstream of the T7 promoter was successfully expressed, with fluorescence from the experimental construct significantly higher than the control. 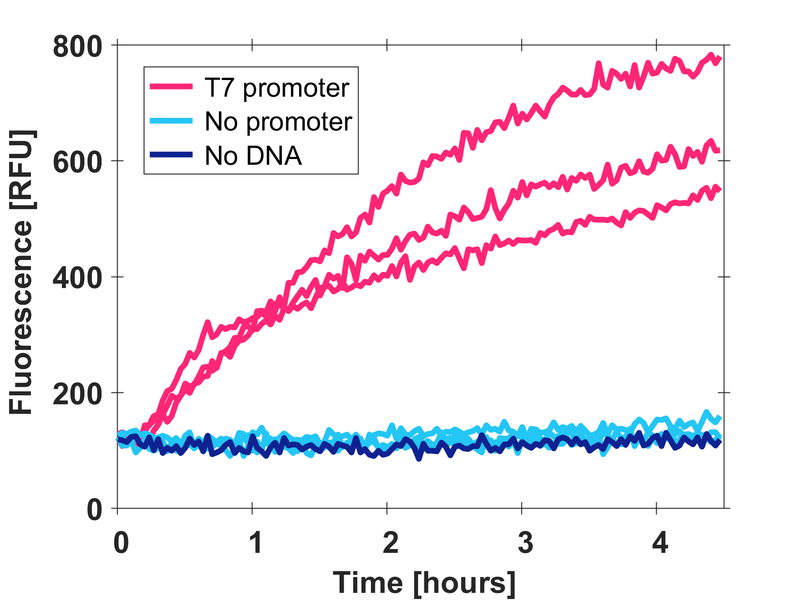 The T7 promoter was characterized in self-made E.Coli lysate from strain BL21(DE). Cell-free T7-GFP-mut3b versus GFP-mut3b (BBa_E0040) synthesis was analyzed. Fluorescence was measured at 37°C for five hours on a plate reader. For details on how the lysate and the energy solution were made and which components went into the final reaction volume of 10uL, check out our protocols. Shown are two times three repeats and a negative control, a shaded error graph (control was subtracted) and a bar plot summarizing the result. GFP-mut3b expression cannot be dinstinguished from the no DNA control. 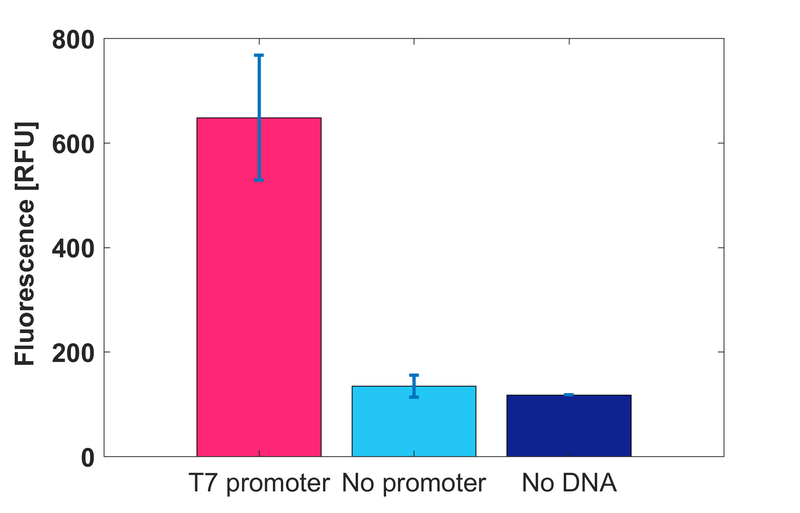 T7-GFP-mut3b expression however is high. Saturation occurs after about five hours. Adding the T7 promoter in front of the GFP-mut3b enables transcription by the T7 polymerase, a much more efficient polymerase than the E.Coli polymerase found natively in E.Coli cells. This part was used as a promoter in the following parts : BBa_K2203001, BBa_K2203002, BBa_K2203003, BBa_K2203004, BBa_K2203005, BBa_K2203006 .